Since Loy Hall was razed to create the Convergent Media Center (CMC), Capital has enjoyed its newest, most pristine building. Loy Hall, originally built in 1905, was the oldest building on campus. After a few setbacks, the completion of the CMC came early in the fall semester of 2016. Like all new things, most people want to keep them clean as long as possible. For example, keeping the box for an eyeshadow palette, the bag that your new shirt came in, or the dust cover on a pair of shoes. Capital isn’t a stranger to this want, and they’re asking for students to help them maintain the cleanliness of the CMC, starting in the 2018 fall semester. Step two comes after you enter the building. Cubbies will be provided for students and staff. This is where all shoes, coats, bags and extra dirt can be stored. No dirty footprints allowed. Disposable slippers will be provided by Capital. If you’d like to use your own, they must be transported to and from the CMC in a sealed plastic bag and sent through a sanitary check to ensure the cleanliness of the slippers. There will also be other prohibited actions such as littering, eating out of assigned areas and hanging up signs anywhere other than the permitted corkboards. There will be sections of the lobby that will allow students to eat without having to worry about spills or crumbs. Students will be able to eat in this secluded area and can only leave by walking under a high-powered fan to blow off crumbs. The room’s tile floors and plastic furniture will make it easy to clean up any surprise spills. This also means that food and drinks will not be allowed in classes, with an exception of water in a sealed bottle. Previously, unnamed offices have created problems by hanging up signs and pictures in unassigned areas. 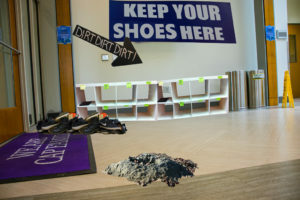 This created a “messy, unorganized look, which does not agree with our new cleanliness code,” according to Jody Funion, provost. Not only do these signs look messy, but they also leave behind a hard-to-clean residue. As always, trash cans and recycling bins will be provided to prevent littering and promote a green campus. If you are caught littering, you could face a fine from CUPD officers. This movement comes at an appropriate time because the CMC is nearing two years since completion. Wanting the CMC to seem new as long as possible mainly comes from the lack of other renovation. As the CMC ages, students will lose the reminder of what work Capital has done. Maintaining cleanliness will maintain newness. Not many will ask for other buildings to be fixed when the image of their newest building isn’t dirty and already wearing down. Capital board members support this movement, saying that the clean environment will promote our green campus and be a comfortable place for students to learn and create in. They also think it will be an easier hit to the budget than a new dorm or building would be. All funding will come from Capital, and students speculate that the funding for this project will raise tuition. No board members have been forthcoming with the cost of this project or its effect on tuition.